Garden stepping stones can transform the look and feel of your outside space. There’s nothing quite like following natural stone paving to the bottom of the garden. Easy to place and fully adaptable to your garden’s design, stepping stones allow you to embrace your imagination and add a quaint, distinctly British touch to your lawn. 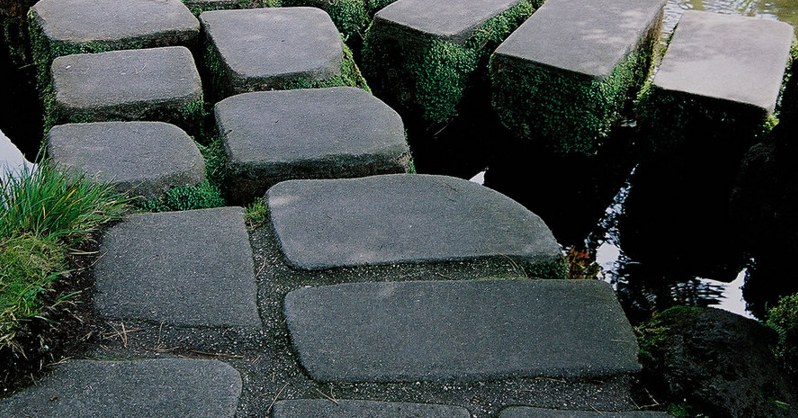 This is why we’ve chosen to shine the spotlight on stepping stones, taking a little look at their origins, their different uses, and how you can pick them to best suit your garden. Stepping stones are versatile garden features, meaning they can be incorporated into all types and varieties of garden. Available in a wide range of materials and designs, you can use them to create unique, individual garden paths. In a traditional garden, stones can be laid to weave a subtle walkway through your lawn or flowerbed, while in city spaces they can be placed across a landscaped area of rock or woodchip to create an attractive yet functional path. Their beauty lies in their flexibility and adaptability, which means they suit a range of garden styles. Stepping stones offer another key design benefit: choice. Available in an extensive range of colours and materials, you can choose stepping stones from a comprehensive design palette. We offer a selection of natural stone paving including Yorkshire Riven, Cotswold, and Millstone. Yorkshire Riven offers the greatest variety of colour options, including Buff, Yorkshire Grey, Weathered York and Brown. If you’re feeling less conventional, you could try a non-traditional material, such log and driftwood, which are perfect for adding a warm, textured, authentic feel to any garden. See our brochure for some examples of the beautiful stone we work with. You should also give consideration to design and size options. Your options are almost limitless, ranging from ornate and detailed to plain and simple. The more unusual and decorative designs can include anything from a footprint to a sunflower, with traditional detailed choices such as the compass design an ever-popular option. Our wide range of options means stones can be cut to a variety of sizes, from large slabs to tiny mosaic pieces. When deciding on the right option for your garden, consider how frequently the pathway will be used. For minimal foot traffic, decorative stones will suffice and add a touch of class to your space. If the stepping stones will form a regular path, opt for larger stones. Despite the many design benefits of using stepping stones, it’s essential to choose high quality materials from a trusted supplier if you want to create a lasting path. Look for stepping stone suppliers that can confidently guarantee durable, natural stone paving. At Minster Paving, we offer a wide range of high quality garden stepping stones and natural stone paving, crafted from a selection of local and centrepiece stone. Available in a wide range of colours and design options, our extensive selection of traditional and nontraditional stepping stones provides the choice and quality you can rely on for years to come. Your new garden path starts with a call. For more stepping stone ideas, contact Minster Paving on 01865 300252 or message us online. How Much Fall Should a Patio Have? What Is the Best Material for Patios?